AAA State of Play Blog: Did You Know the Benefits of a Dome Climber? Kids love to explore different kinds of playground equipment, be it the swing, the slide or the seesaw. The above mentioned pieces of equipment run high in the ‘fun’ factor. But there is one playground equipment which is not only ‘fun’ but is also beneficial for your kids. 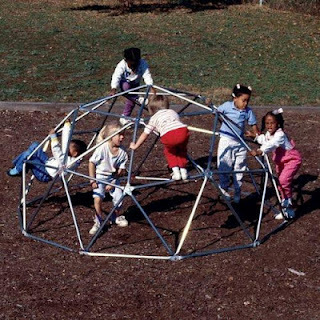 We are talking about the Dome Climber- which is a playground structure that kids love to play in for hours on end. This geometric metal climbing dome structure is not only the source of entertainment for your kids but it also builds their physical strength and keeps them flexible & fit. It is no wonder that the Dome Climber is a hit with the kids. They love to climb, do a bit of gymnastics and play in the structure. It also presents a challenge before the kids as they want to quickly excel in climbing up or down the dome. While playing in the Dome Climber, their muscles become strong and grip enhances, while they are busy trying various imaginative formations on the dome climber. Kids are always full of energy. They love to climb and dome climber is just the perfect structure for such activities. You will be astonished to see how much time they love spending in the Dome Climbers. Now that you know how beneficial a dome climber is for the kids, you must buy one for yours. You can easily place it in your backyard playground or get it installed in the community playground, church, school etc. AAA State of Play has a wide selection of Dome Climbers just choose the one that you find fit for your kids. Why Do You Need Playground Mulch?